Life was simple when I grew up in Canada. Winters were long and cold, we had no air conditioning, walls dried to both the outside and the inside and the Toronto Maple Leafs would win Stanley Cups. That all changed when we started putting plastic on the inside of walls and began to put impermeable insulating sheathing on the outside. We started to have double vapor barriers. Shakespeare was right in “that Scottish play2". Double vapor barriers meant “double toil and trouble”. With double vapor barriers if a wall got wet it would not be able to dry to either the outside or the inside. In the old days assemblies worked just fine with no vapor barriers on either side. That approach still works today, but for reasons that are difficult for me to understand it is not used as often as it should be or could be. We looked at this in “BSI-071: Joni Mitchell, Water and Walls” and we will look at it again here. For the record, it makes no sense to have a vapor barrier on both sides of an assembly. If the assembly gets wet or starts out wet we are pretty much doomed…except if we are perfect and we start out dry3. Also, for the record, it is ok to have a vapor barrier on the inside of an assembly and design and construct the assembly to dry to the outside. But there are requirements on how and limits on where. Finally, for the record, it is ok to have a vapor barrier on the outside of an assembly and design and construct the assembly to dry to the inside. But there are requirements as to how based on where. So, back in the day, Figure 1a ruled Canada and the United States. It could dry in both directions. It could tolerate leaky windows and missing flashing. It could rain on it and snow on it during construction. It was awesome. The only thing wrong with it was that it did not have a lot of insulation. In fact, that is what helped it be awesome. It was poorly insulated by the standards of today and the resulting energy flow helped it dry when it got wet or when it started out wet. Folks also forget that it worked well in the winter in cold climates because interior moisture levels were low back in the day because of high dilution rates driven by old atmospherically coupled chimneys, the stack effect and not the most airtight of building enclosures. The same wall seeing today’s interior conditions wouldn’t work so well in cold climates during the winter months. Figure 1a (above left): The “Old Wall” – The wall that ruled Canada and the United States. Kraft faced fiberglass batt insulation and vapor open fiberboard sheathing. Figure 1b (above middle): The “New-Old Wall” – A ventilated cladding coupled with a vapor semi permeable sheathing (OSB) and a higher level of cavity insulation. This wall can not be used in very cold climates – IECC Climate Zone 7 or above 5000 HDD in Canada. Use Wall 1c in those climates – or Walls 2b, 2c, 3a, 3b or 3c. Figure 1c (above right): High Performance Flow-Through Wall – A ventilated cladding, vapor open continuous insulation coupled with a vapor semi permeable sheathing (OSB) and a higher level of cavity insulation. This wall works everywhere. The thermal resistance of the exterior continuous insulation is climate dependent. Things changed in the 1970’s in Canada. The changes started in the 1960’s but really took hold in the 1970’s. We got rid of big chimneys and got rid of big holes, lowered air change and added insulation. It became obvious that walls needed to be prevented from getting wet from the inside during the winter and the most common approach taken to address this was the use of a sheet plastic polyethylene vapor barrier (Figure 2a). Figure 2a (above left): The “Old Plastic Wall” – The wall that kinda worked with fiberboard but not with OSB. Don’t use this wall with air-conditioning. Figure 2b (above middle): The “New Plastic Wall” – The wall that works with OSB because of the ventilated cladding. Don’t use this wall with air-conditioning. Figure 2c (above left): High Performance Plastic Wall – This wall works well. Just don’t use it with air-conditioning. Never mind that the main wetting concern was air leakage not vapor diffusion. The vapor barrier ruled. A young Quebec architect tried to set a few things straight with help from some older guys at the National Research Council of Canada4. Rick Quirouette wrote his famous vapor barrier paper5. It came a decade after Gus Handegord wrote his famous vapor barrier paper and Grant Wilson wrote his famous air leakage paper which both came a decade after Neil Hutcheon wrote his famous enclosure paper. We also covered this here about a decade ago (“BSD-106: Understanding Vapor Barriers” and “BSD-104: Understanding Air Barriers”). There is a pattern here – every decade or so we tend to revisit the same principles. Air leakage was and is more important than vapor diffusion. Things have not changed. Architects beware. If you forget this the ghost of Hutcheon6 will haunt you like the ghost of Banquo haunted Macbeth. Folks used and some are still using plastic vapor barriers to solve what was and is really an air leakage problem. You do not have to use a plastic vapor barrier to solve an air leakage problem. This is obvious, but yet, we still have folks swearing that it is necessary. We learned long ago that we can address air leakage with other materials that are not also vapor closed. The most common being drywall7. Drywall used to control air leakage has the advantage of being vapor permeable – a wall can still dry to the interior. Check out Figure 1b. The drywall is caulked or glued or gasketed to the framing. It has all of the advantages of Figure 2a without any of the disadvantages. Recall, in Figure 2a, the polyethylene is there to control airflow not vapor diffusion. A couple of things to note in Figure 1b - an unfaced fiberglass batt or netted or blown fiberglass or cellulose insulation is used as cavity insulation and OSB sheathing is used in place of fiberboard. We don’t need the kraft facing on a fiberglass batt to control vapor diffusion as the latex paint on the gypsum board performs pretty much the same function. But we do have to compensate for the reduction in vapor permeability of the exterior sheathing in some way. OSB is very different than fiberboard – and very different than plywood (we were already here before, check out “BSI-038: Mind the Gap, Eh?”). The real key to this assembly is the air space between the cladding and the OSB sheathing. The air gap significantly improves outward drying, controls rain induced hydrostatic pressure and facilitates redistribution of absorbed water in the OSB sheathing. We didn’t build wall 2a for very long in Canada. We replaced the fiberboard with OSB sheathing and increased the cavity thermal resistance. Drying potentials were significantly reduced. The wall didn’t work very well. Just ask the folks in Vancouver. To fix it, the folks in Vancouver added the furring strip and presto the resulting air gap made things work again (Figure 2b). They could have used wall 1b, but energy conservation politics got in the way. The worshipers in the “Church of Polyethylene” were very powerful. The good news is that the “polyethylene cult” did not spread too far south of the border– only Minnesota and parts of Wisconsin seemed to get affected. The interior polyethylene sheet has a big liability in buildings that are air-conditioned – it results in a vapor barrier on the wrong side of the wall. You would never want to construct a wall with an interior plastic vapor barrier in the lower 48 states where you have air conditioning for more than a couple of weeks. That means interior plastic vapor barriers in the US should be limited to IECC Climate Zones 6 and 7 – or higher. In Canada, that means in zones where the Celsius Heating Degree Days above 18 degrees C are 4000 or higher. So no plastic in Toronto – leave plastic to the folks in Ottawa and Montreal. That is why the Leafs don’t win Stanley Cups. We started putting plastic in walls in Toronto in the 70’s and they stopped winning. If you use wall 1b you don’t need a plastic vapor barrier even in IECC Climate Zone 6 – in Canada that would be up to 5000 HDD (18 C). But when we get to IECC Climate Zone 7, wall 1b gets too risky – above 5000 HDD in Canada. You need to go to the wall in Figure 1c. You can build this wall everywhere. Even in Canada. The thermal resistance of the continuous exterior vapor open rigid insulation is climate dependent. The colder it is, the higher the thermal resistance. Does wall 2b work in IECC Climate Zone 6 and 7? Yes. Does it work everywhere in Canada? Yes, pretty much, except near Windsor, Ontario or other places where they air -condition. Windsor is south of Detroit and close to the same latitude as Northern California. We air-condition a lot in Windsor. Same goes for the wall in Figure 2c. Wall 2c is a very nice wall. Just don’t use it with air-conditioning. Now just because we can use walls 2b and 2c almost everywhere in Canada does not mean we should use them everywhere in Canada. Check out the walls in Figure 3a, Figure 3b and Figure 3c. They all have “vapor barriers” on the exterior. They also can work everywhere in Canada (and the US) because of the thermal resistance outboard of the condensing surfaces. Adding interior vapor barriers to these three walls is completely unnecessary and quite frankly risky. You want these walls to be able to dry in at least one direction. They can’t dry outboard due to the material properties of the insulation boards and the spray polyurethane foam (SPF). So they need to be allowed to dry inward. No interior poly please. Figure 3a (above left): High Performance Exterior Continuous Insulation Sheathing – This wall works everywhere. The thermal resistance of the exterior continuous insulation is climate dependent. Figure 3b (above middle): Cavity Foam Wall – This wall works everywhere. The thermal resistance of the SPF in the cavity is climate dependent. Figure 3c (above right): High Performance Exterior Spray Foam Wall – This wall works everywhere. The thermal resistance of the SPF is climate dependent. With all of the work we have done over the past 3 decades in Canada– especially the work out of our Vancouver test hut (“BSI-058: Parthenon, Eh!”) I am pretty convinced that it is hard to beat the performance of Wall 1c and the three wall 3’s – Wall 3a, Wall 3b and Wall 3c. These walls work better than Wall 2b and Wall 2c. Other folks have come to the same conclusion. Canada Mortgage and Housing Corporation (CMHC) funded a study done by Halsall Associates and the University of Waterloo “Building Engineering Group” (BEG) that is pretty conclusive in the same regard8. But here is the rub. I can build these walls anywhere in the US without having to employ the services of a licensed professional engineer or architect. I can’t do that in Canada. I can only build them under Part 5 of the National Building Code of Canada under engineering or architectural seal. I have no prescriptive path open to me under Part 9 of the National Building Code of Canada. Amazing, the best performing walls are being discouraged due to regulatory complexity. And not just the best walls, but the best assemblies. Check out Figure 4a and Figure 4b. I can’t build these rim joist assemblies in Canada without a sealed letter from an engineer or architect. You have got to be kidding. Figure 4a (above left): Exterior Insulated Rim Joist – The thermal resistance of the exterior continuous insulation is climate dependent. Figure 4b (above right): Spray Polyurethane Foam Rim Joist - The thermal resistance of the SPF is climate dependent. As a Canadian, I never, ever thought I would say this, but Canada should follow the American code example and provide a prescriptive path to not have to install an interior vapor barrier like sheet polyethylene. The fact that the American code language is based on Canadian work is all the more ironic. As for Minnesota and Wisconsin and their love of polyethylene? They do play hockey there. They are polite. They are humble. They are pretty much Canadian anyway. So by fixing the Canadian code Minnesota and Wisconsin would likely be fixed too. Was Macbeth talking about elements of Part 9 the National Building Code of Canada? Handegord, G.O., “Vapor Barriers in Home Construction”, Canadian Building Digest 9, September 1960. Hutcheon, N.B. ; “Fundamental Consideration in the Design of Exterior Walls for Building”, NRC Paper No. 3087, DBR No. 37. Division of Building Research, National Research Council of Canada, Ottawa, 1953. 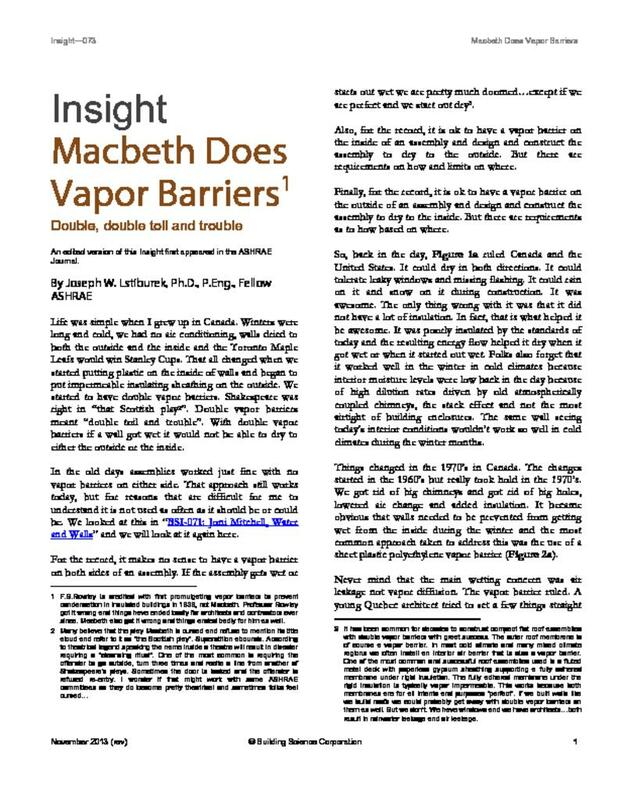 F.B.Rowley is credited with first promulgating vapor barriers to prevent condensation in insulated buildings in 1939, not Macbeth. Professor Rowley got it wrong and things have ended badly for architects and contractors ever since. Macbeth also got it wrong and things ended badly for him as well. It has been common for decades to construct compact flat roof assemblies with double vapor barriers with great success. The outer roof membrane is of course a vapor barrier. In most cold climate and many mixed climate regions we often install an interior air barrier that is also a vapor barrier. One of the most common and successful roof assemblies used is a fluted metal deck with paperless gypsum sheathing supporting a fully adhered membrane under rigid insulation. The fully adhered membrane under the rigid insulation is typically vapor impermeable. This works because both membranes are for all intents and purposes “perfect”. If we built walls like we build roofs we could probably get away with double vapor barriers on them as well. But we don’t. We have windows and we have architects…both result in rainwater leakage and air leakage. It was 30 years from the time of Rowley’s paper before it was clearly established and widely accepted that the leakage of air from inside a building through constructions and not vapor diffusion alone was often the principal means by which water vapor moved to cold surfaces. The concept of vapor diffusion was not wrong, but it was not the only way. It is incredible, in retrospect, that it should have taken so long to reach this conclusion…” N. B. Hutcheon, 1978. Professor Hutcheon figured this out with Gus Handegord and Grant Wilson in the 1950’s. He thought he put it to bed in the 1970’s. Youngsters like me thought we absolutely crushed it in the 1980’s and here we are still fumbling around with this now. Quirouette, R.L., The Difference Between a Vapor Barrier and an Air Barrier, Building Practice Note No. 54, National Research Council of Canada, Division of Building Research, ISSN 0701-5216, July 1985. Rick is still active today. He started the Building Envelope Councils (the BEC’s) a concept that spread south. I fondly remember the coffees I had with him in Ottawa after my weekly early morning drives up from Toronto to see Gus Handegord. He said that I always looked like I got hit by a fire hose when Gus was done with me. Hutcheon, N.B. ; “Fundamental Consideration in the Design of Exterior Walls for Building”, NRC Paper No. 3087, DBR No. 37. Division of Building Research, National Research Council of Canada, Ottawa, 1953. This was the legendary paper that started it all for many of us. Wilkinson, J.; Ueno, K.; De Rose, D.; Straube, J., and Fugler, D.; “Understanding Vapor Permeance and Condensation in Wall Assemblies”, 11th Canadian Conference on Building Science and Technology, Banff, Alberta, 2007. According to Professor Eric Burrnett, who founded the group, the acronym “BEG” also signifies what they have to do to get funded.